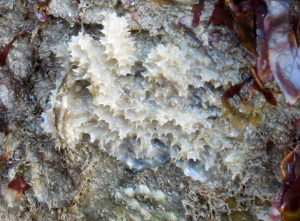 Observation - Encruster Sponge - UK and Ireland. Description: Annual emptying of Thanet's largest tidal pool (at low tide end would be 5m) Found in sublittoral, submerged probably most of the time here, when the sluice gates are shut. These sponges (I think) were common place here in what would be sublittoral areas. Annual emptying of Thanet's largest tidal pool (at low tide end would be 5m) Found in sublittoral, submerged probably most of the time here, when the sluice gates are shut. These sponges (I think) were common place here in what would be sublittoral areas. New to me.